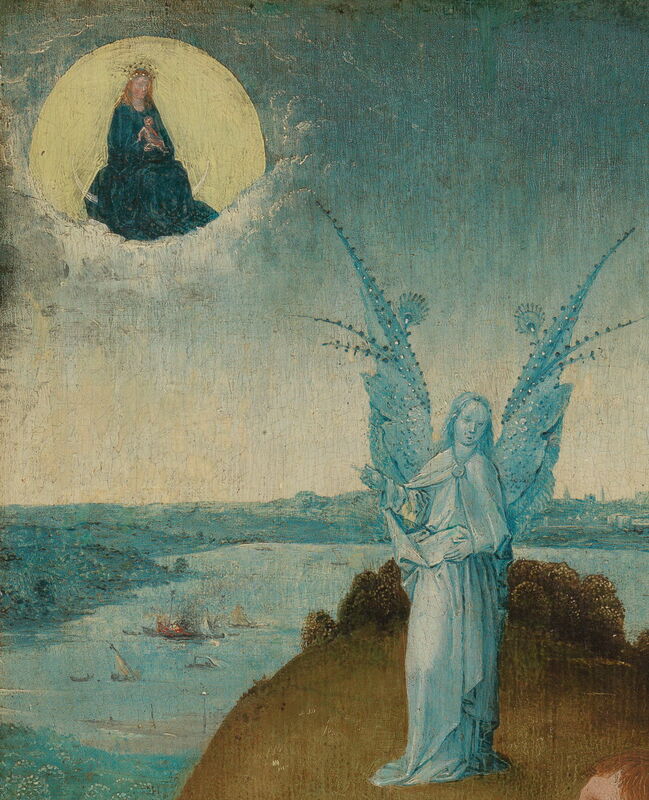 Hieronymus Bosch (c 1450–1516), Saint John on Patmos (detail) (c 1490-95) (CR no. 6A), oil on oak panel, 63 × 43.2 cm, Gemäldegalerie, Staatlichen Museen zu Berlin, Berlin. Photo Rik Klein Gotink and image processing Robert G. Erdmann for the Bosch Research and Conservation Project, via Wikimedia Commons. 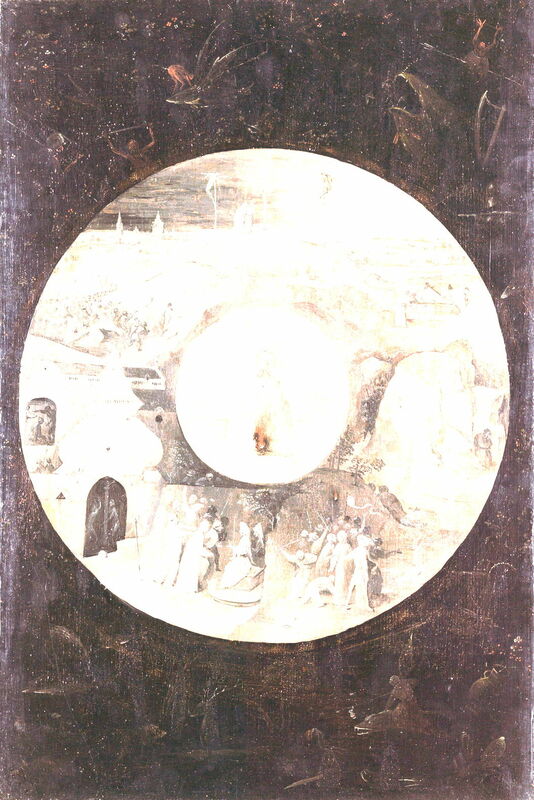 A finely painted portrait of John of Patmos in a landscape, which was originally part of an altarpiece, with a reverse side showing scenes from the Passion of Christ. This is the earliest painting to bear Bosch’s signature, and may contain a caricature self-portrait. John, the author of the Book of Revelation, has widely been considered to be the same person as the author of the Gospel of John, and John the Apostle, the son of Zebedee. However some scholars have argued that they may in fact be two or even three different people. For the purposes of this painting, they are one and the same, and the patron saint of Sint-Janskerk in Bosch’s home town of ‘s-Hertogenbosch. It appears that John, practising and preaching as a Christian during the Roman rule of Domitian, was banished to Patmos as a result. While he was there, he wrote the book of Revelation, addressed partly as a letter to the “seven churches of Asia”. Much of the rest of the book consists of a series of prophetic visions, featuring well-known figures such as the Whore of Babylon and the Beast (of 666 fame). It culminates in his description of the Second Coming of Jesus. Saint John the Apostle’s attributes are a book (from his authorship of the gospel and possibly Revelation), a serpent in a chalice (from hagiography, a poisoned cup), a cauldron (from his being plunged into boiling oil and surviving), and an eagle (symbolising the height to which he rose). 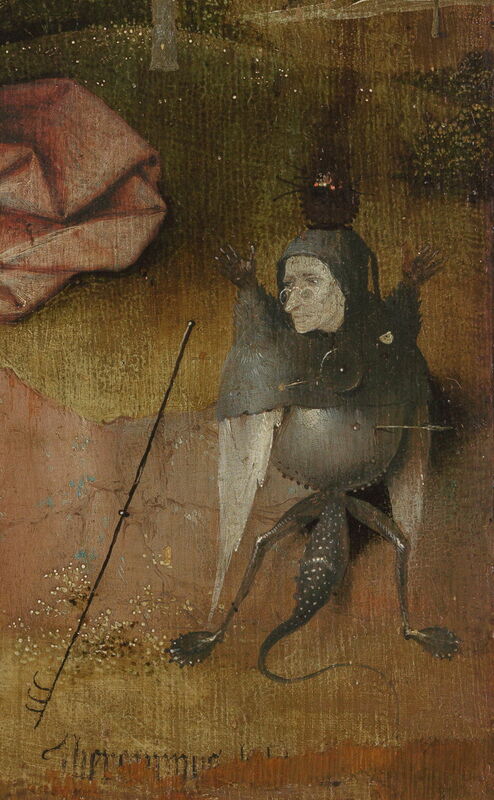 Hieronymus Bosch (c 1450–1516), Saint John on Patmos (c 1490-95) (CR no. 6A), oil on oak panel, 63 × 43.2 cm, Gemäldegalerie, Staatlichen Museen zu Berlin, Berlin. Photo Rik Klein Gotink and image processing Robert G. Erdmann for the Bosch Research and Conservation Project, via Wikimedia Commons. 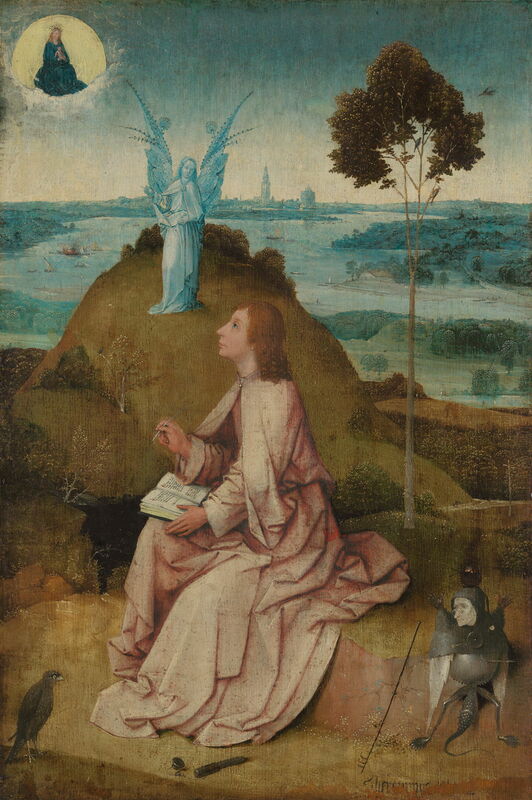 Saint John is seated, writing, in the midst of a deep and extensive landscape, with an angel on a nearby hillock, and looking up to a vision of the Virgin Mary and Child. He sits on a raised slab of ground, in the midline of the painting, facing to the viewer’s left. He wears pale red robes, which rest in folds on the ground around him. He is looking up towards a discrete vision in the top left corner of the painting. 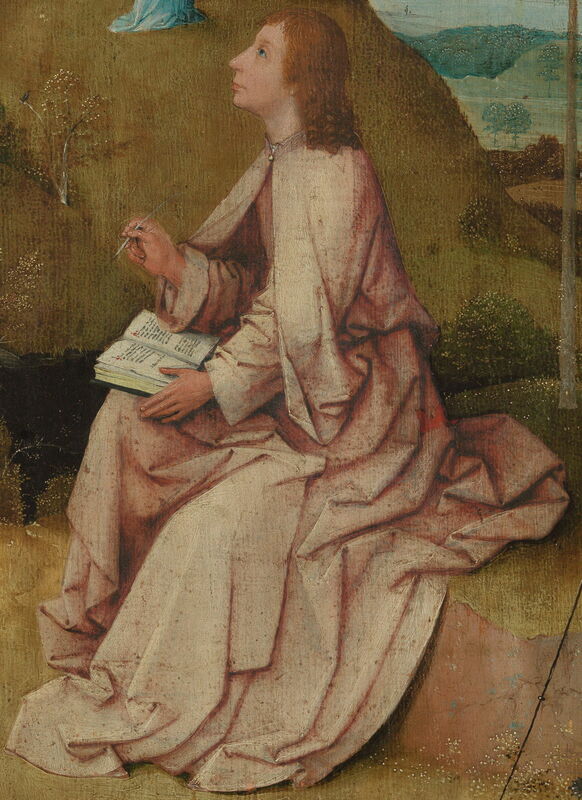 His right hand holds a quill pen, which is poised in mid-air over a book in which he has been writing. His left hand steadies the book, which rests on his crossed right thigh. On the ground, in front of him, is a small, dark eagle-like bird. On the ground to his left are an inkwell and a knife for sharpening his quill. He is leaning slightly forward, but looking up at the vision. He appears young, clean, and smart. On a raised hillock deeper into the painting is an angel, whose wings bear decoration in the manner of a peacock. The angel is pointing to the vision, which is set in a golden disk similar to the sun, showing the Virgin Mary, dressed in blue, holding the infant Christ on her lap, over a crescent moon. The disk is wreathed in cloud. At the right, behind John, is a tall, straight tree which almost reaches the top of the panel. At the right edge is a simple and small crucifix. The foreground hills drop steeply to the background, of a broad and heavily-wooded river and a city, which probably represents ‘s-Hertogenbosch, with its prominent cathedral. Many vessels are on the river, and at the left, two appear to have collided and caught fire. In the lower right corner, there is a curious creature resembling a cross between an insect and a bird, with a human head and face which is wearing spectacles (pince-nez); this is presumably a caricature of the artist as the devil. Below that is Bosch’s signature, partially lost through wear. Hieronymus Bosch (c 1450–1516), Passion Scenes (c 1490-95) (CR no. 6B), oil on oak panel, 63 × 43.2 cm, Gemäldegalerie, Staatlichen Museen zu Berlin, Berlin. Photo Rik Klein Gotink and image processing Robert G. Erdmann for the Bosch Research and Conservation Project, via Wikimedia Commons. 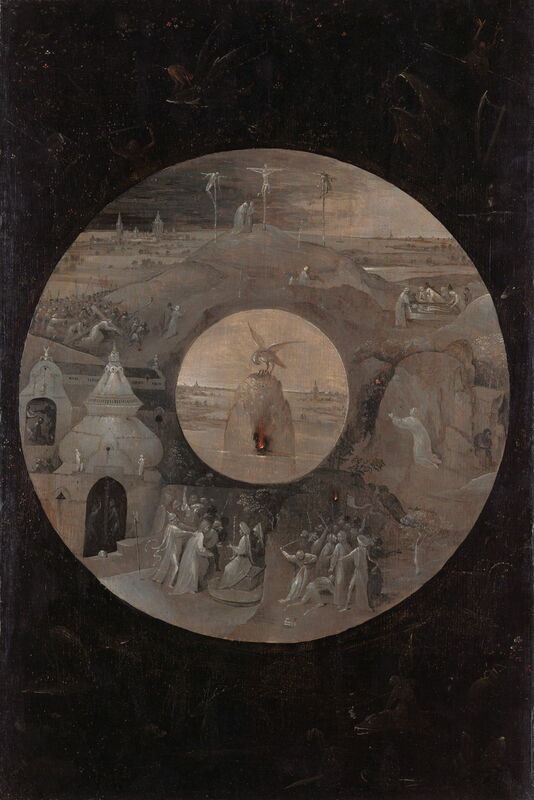 On the other side of the panel, Bosch has painted a series of scenes from the Passion of Christ in a circle, around a central image of a pelican feeding its young with its own blood, a well-known symbol of self-sacrifice. These scenes are painted in a brown grisaille, with small patches of orange and red to represent flames. The scenes shown start at the 5 o’clock position, with the betrayal and arrest in the Garden of Gethsemane, and move clockwise from there. The next shows Christ brought before his judges, then his scourging and beating. The upper section shows a sequence from his carrying the cross to Golgotha, his crucifixion there, and his body laid in the tomb. The final scene, at the 3 o’clock position, shows his resurrection from the tomb. Hieronymus Bosch (c 1450–1516), Passion Scenes (maximum brightness) (c 1490-95) (CR no. 6B), oil on oak panel, 63 × 43.2 cm, Gemäldegalerie, Staatlichen Museen zu Berlin, Berlin. Photo Rik Klein Gotink and image processing Robert G. Erdmann for the Bosch Research and Conservation Project, via Wikimedia Commons. The nearly black area surrounding this grisaille contains many small and much more unusual images, seen better above with brightness and contrast optimised. These include a man riding on a large fish with wings, a man in a barrel, a large fish with its mouth open, a crucifix, and many other figures which might be more typical of Bosch’s later paintings. Paintings of John on Patmos – whoever he might actually have been! – have been popular depictions of John the Apostle, a major figure in the New Testament and the very early years of the Christian Church. The basic scheme showing John in a landscape, recording details of his vision, is masterfully painted, but quite conventional. It is also quite common to overlook the fact that Patmos is an island, and to set John in a landscape quite alien to the reality of Patmos – here the city in which Bosch lived, and the site of the church for which the altarpiece was intended. Master of the Rotterdam Saint John on Patmos (fl 1475-1500) or Circle of Dieric Bouts (c 1420-1475), Saint John the Evangelist on Patmos (1475-1500), oil on oak panel, 69.5 x 65 cm, Museum Boijmans Van Beuningen, Rotterdam, The Netherlands. Wikimedia Commons. 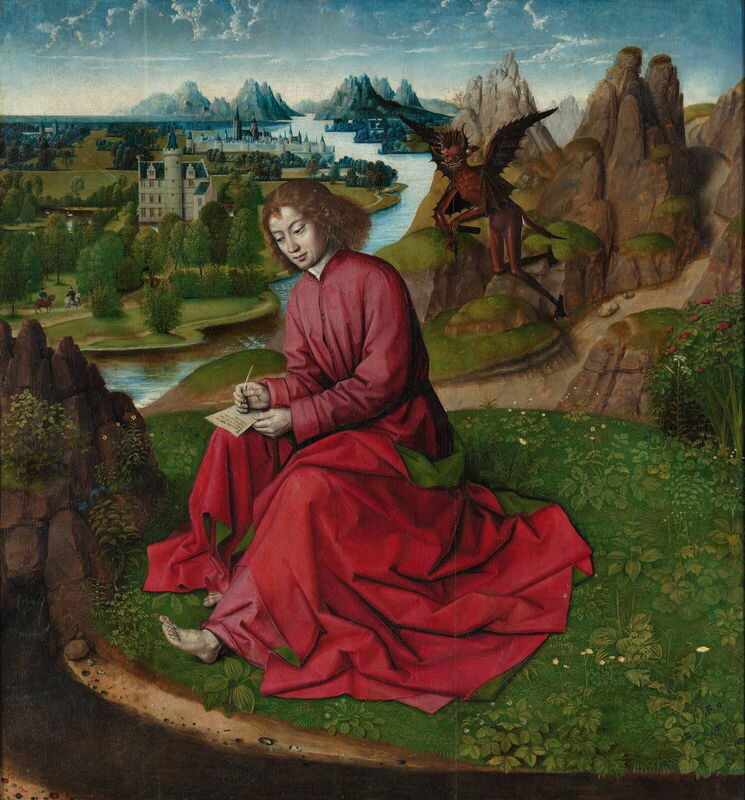 Saint John the Evangelist on Patmos (1475-1500) was probably painted slightly earlier, either by a member of the circle of Dieric Bouts (c 1420-1475), or by an otherwise unknown artist in Rotterdam. Pictorially it uses similar elements, although here John’s vision is of the devil behind him. Hans Baldung (1485–1545), Saint John the Evangelist on Patmos (c 1511), oil, gold and white metal on spruce wood, 89.5 × 76.8 cm, The Metropolitan Museum of Art, New York, NY. Wikimedia Commons. 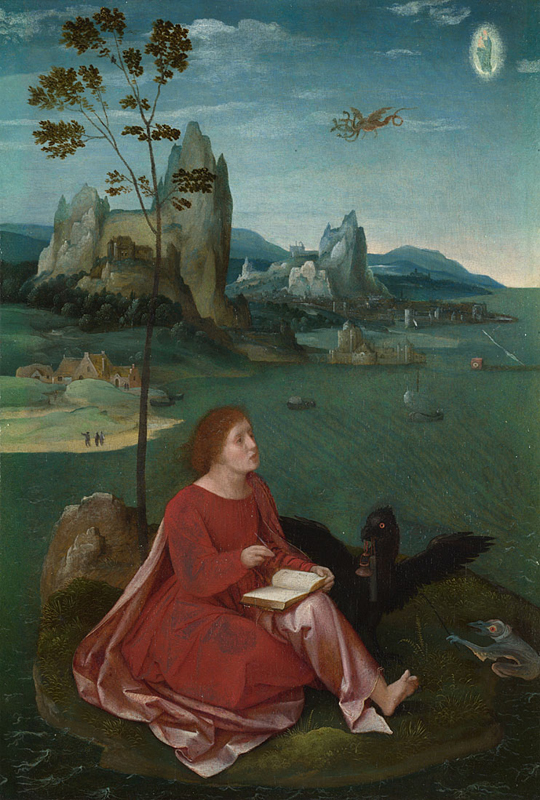 Hans Baldung’s slightly later Saint John the Evangelist on Patmos (c 1511) even gives its eagle its own small halo, and like Bosch’s uses a vision of the Virgin and child, astride a crescent moon, a slight conflation of what were originally two visions. 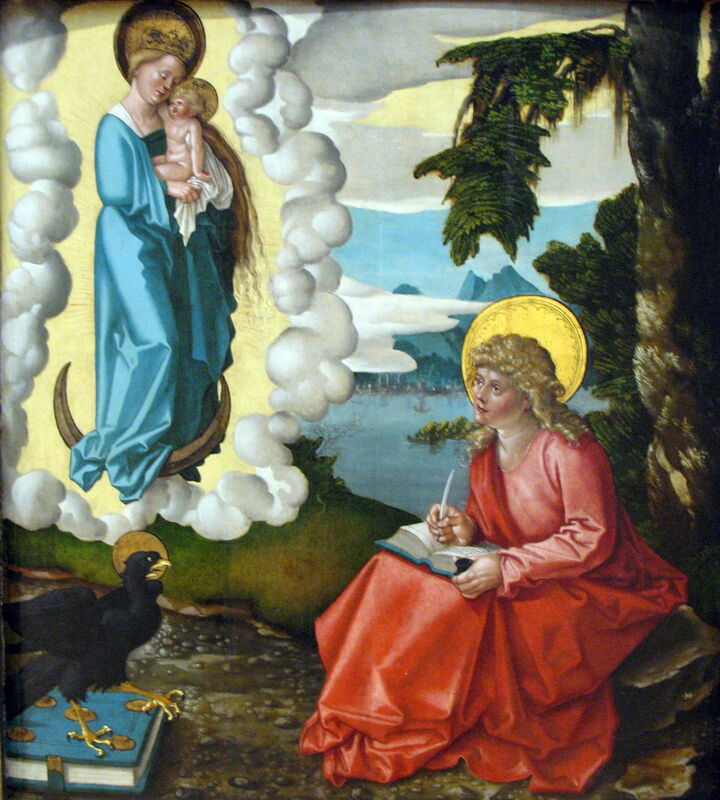 Rather later, the ‘Master of the Female Half-Lengths’ painted quite a similar Saint John on Patmos (c 1540). Unlike the accompanying panel of Saint John the Baptist, the vegetation and most other details on the front of this panel appear faithful to natural appearances. The only two details which are more unusual are the vessels on fire on the river, and Bosch’s little chimera at the lower left, by his signature. The fire on the river may be an allusion to the catastrophic fire which all but destroyed ‘s-Hertogenbosch in 1463, which Bosch would have seen when he was a child. The diabolic chimera has been read simply as a representation of the devil, with various symbols stemming from its curious construction. Although this may be the case, its caricature face and proximity to Bosch’s signature suggest that it may also be intended as a humorous graphical signature. As there do not appear to be any other portraits or self-portraits made during Bosch’s lifetime, this question will remain open. The reverse side is different. Whilst the more clearly visible scenes of the Passion are quite conventional in their form, and probably relate to a contemporary engraving, the much darker surround contains more fantastic creatures and events. Sadly these are very difficult to see now, although more readily viewed in infra-red reflectograms. This suggests that these two panels were painted early in the transition from Bosch’s initial more conventional style, as shown in his Adoration of the Magi, and that the donor in Saint John the Baptist was overpainted at least a couple of years later, when his inclusion of more fantastic images had become more established. In order to overpaint the donor as he did, Bosch would also have had to invent a sizeable object which was not in the original composition, which could have encouraged the more fantastic. However, in this Saint John on Patmos, his original composition and content remained quite conventional and, as it did not need any later repainting, was allowed to remain so. This is almost certainly one of two panels created by Bosch for the altarpiece of the Brotherhood of Our Lady, Sint-Janskerk, ‘s-Hertogenbosch. This is thought to have consisted of wood carvings by Adriaen van Wesel in 1476-7, this painting and Saint John the Baptist (previous article) by Bosch, and paintings by Gilles Panhedel in 1521-2. At a later date, the altarpiece was broken up into its separate panels. Thankfully this panel was spared the mutilation to which the other panel by Bosch was subjected, and remains close to its original size, with both sides painted. Fuller details are in Ilsink et al. (2016), p 164. Matthijs Ilsink, Jos Koldeweij et al. (2016) pp 160-179 in Hieronymus Bosch, Painter and Draughtsman: Catalogue Raisonné, Yale UP and Mercatorfonds. ISBN 978 0 300 22014 8. Posted in General, Painting and tagged 's-Hertogenbosch, Baldung, Bosch, painting, self-portrait. Bookmark the permalink. Thank you. I’m not a dealer or valuer, but that sounds fascinating. I have no idea whether it might be valuable, but I think an art historian might be most interested. I suggest that you get a good digital image made of it and contact the Hieronymus Bosch Research Project – details online – as they will be able to give you advice and put you in touch with someone more local who can take a look for you.